This weekend sees some pretty good games get decent discounts: Heroes of Might and Magic V + Expansions, Dark Messiah of Might and Magic, and Zeno Clash. You can pick them up individually, or in packs. 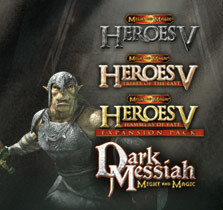 It looks like it may be cheaper to pick up Dark Messiah and the HM&M5 pack separately, rather than together in a single pack. Together, for $10, is a great deal on these games. Eets is a great puzzle game (also available for the xbox 360), and Multiwinia is a multiplayer version of Darwinia. Trials 2 is a very frustrating (but fun) 2d motorcycle game involving the arrow keys and physics-based stunts.